Landscape Service Testimonials | York, Hanover, Lancaster PA | Summit Landscape Development Inc.
"Everything is just so beautiful! Your workers were very professional and friendly. Thanks so much for the lovely addition to our home." 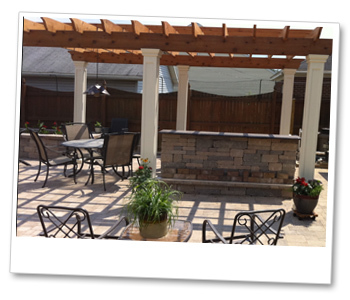 "Once again you and your crew have done an outstanding job on our landscaping. The final touches of the tree and completing the block work look great. We so appreciate the professional job that you do." "We just wanted to thank you for a job well done! We are so pleased with everything! The wall looks spectacular and the shrubbery is impeccable. It's just what we wanted. You and your fellow crew members were always cordial and polite. Always willing to do what we asked of you. For example, cutting the pipes down lower in the front so they couldn't be seen sticking out above the retaining wall. Also, the landscape crew brought an extra piece of flag stone and laid it down for our water fountain and lastly you let me tweak your design plan by allowing me to add a little bit of color. We appreciated the extra steps your crew had taken to accommodate our wishes. We look forward to working with you in the future"
"I wanted to take a moment and write you a quick letter to thank you for the fantastic job Summit did with the installation of our flagstone patio. We have received nothing but compliments from neighbors and friends. Originally we considered the use of stamped concrete for our patio but felt that flagstone was a much better fit for our home. We now have neighbors who spent twice as much as we did regret their choice in using stamped concrete. The flagstone blends so well with our home. Again thank you for doing such a marvelous job!!!" "We absolutely love the pond and have had many compliments - already! The blue heron love it too. He's already been here! This means WAR! Thanks again!" "Stan and I want to THANK YOU for the work you did for us. We especially like the return you suggested at our walk. That totally finishes off that area. We are happy with the entire project and your crew was fun and courteous.